More than 900 women travelled to England and Wales during same period. 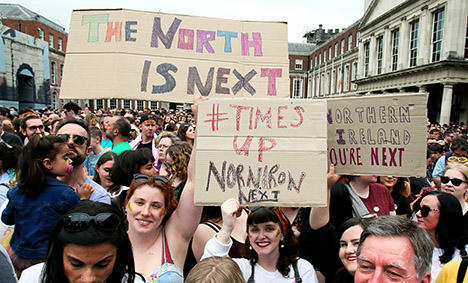 ‘Significant gap’ between number of women legally allowed abortions in Northern Ireland and the number of women forced to travel for the service. “There’s a significant gap between the number of women who were allowed an abortion in Northern Ireland last year compared with the number of women who travelled to access the service. This demonstrates just how restrictive and unfit Northern Ireland’s abortion law is. “Because of the near-total abortion ban in Northern Ireland, up to one thousand women fly to other parts of the UK to have abortions every year. Countless others go online to purchase abortion pills, risking prosecution in doing so. “How can it be the case that it’s ok for women to fly to England, or now get a train to Republic of Ireland to have an abortion, but it’s not OK for them to access the health service at home? It makes no sense. It’s time the UK Government ended the hypocrisy and inequality. “Northern Ireland has one of the cruelest abortion laws in the world, and our reproductive rights are falling further and further behind. In 2017/18, more than 900 women travelled from Northern Ireland to England to access abortions. Tomorrow (24 January), Amnesty will give evidence to the Women and Equalities Committee as part of its inquiry into the abortion law in Northern Ireland. Amnesty will urge the Committee to finally bring an end to the archaic law which harms women by recommending that the UK Government decriminalises abortion, and puts in place a human rights compliant framework for access.